Jango even sold his body for money...doesn't that make him a manwhore? Cool gatgets are an obvious compensation for some complex....what could it be? Not being FS....or shortness? What did he do with his feelings??? I never understood why so many people loved Boba Fett in the OT. He never left a memorable impression on me in the few scenes he had. Young Boba was cute though, and I felt sorry for him when he lost his father. @Forsythia wrote: I never understood why so many people loved Boba Fett in the OT. He never left a memorable impression on me in the few scenes he had. Young Boba was cute though, and I felt sorry for him when he lost his father. 1. He is not on either the side of the Empire or the Rebels. 2. Has some sense of honor towards fellow bounty hunters- is angry with Asajj Ventress for leaving him behind during one of their missions as bounty hunters but still saves her life on another occasion. 4. He has awesome gadgets and jet pack armour. 5. He managed to escape getting killed in the sarlac pit (hinted in recent novels) which shows even a sarlac cannot get the better of him. If we go by the movies, he is mysterious but nothing great...and his "death" in the sarlac pit is hilarious...but if we look at his life in all the canon material, he is an interesting character. Boba Fett looks cool and defeats the good guys, which was an important turning point. He seems to take no sith from Vader either. Agreed his death was super lame. I like how Captain Rex in TCW can shoot with both hands, which is similar to Boba Fett. As to Boba Fett, my son, when he was 5, saw a youtube video with Boba Fett and then wanted to dress up as Boba Fett for Halloween. I had to order it online. Of course, nobody knew who he was dressed as, the little geek, but he was proud of his cool costume. So... I don't know, there's something. I voted for "Don't give a damn." Never cared for them when I was a kid and I still don't. 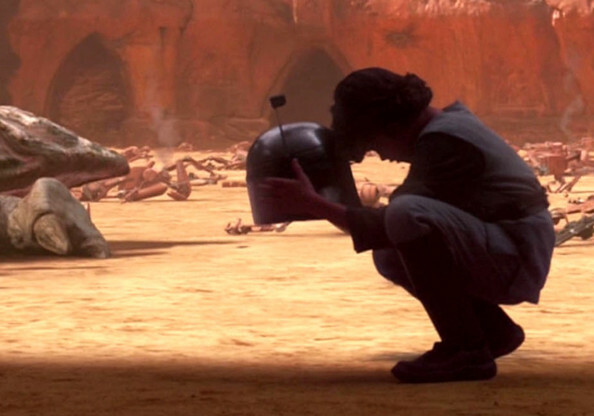 It's also hard for me to fathom why Boba Fett is so damn loved in spite of having five lines total in the entire OT. That said, young!Boba Fett was adorable and I did feel sorry for him when his father died. I have never understood the obsession with Boba Fett. I think he is a pretty pointless character. He also seriously creeped me out in TCW. All you ladies here are very insightfull and sharp. This poll is missing something!! Gahhhh!!!! I love Boba Fett! Let me clarify though. I loved Boba Fett more before GL gave him that ridiculous backstory in AotC. Part of Boba's appeal for me was his mysteriousness. I think GL wanted to cash in on a sleeper character that was an unexpected hit among fans. He was good the way he was. He didn't need a backstory for improvement. Nothing could have been as good as what I had built up in my head around him. On second thought, the same reason I loved Boba so much are many of the same reasons I love Reylo. It's the mystery - wondering how much each knows about the other and where their story will go. I think the name is more memorable than the character. Pretty much all I have to say on the subject. @Search Your Feelings wrote: This poll is missing something!! I don't think the poll can be edited....but let me ask the admin if there is some way it can be done. @IoJovi wrote: Gahhhh!!!! I love Boba Fett! I thought you were a friend, but I guess I, I guess I hate you.."
What kind of a message is that for young girls???!!!! Hey....everyone chooses for themselves, right? Btw...are you on SWNN Cantina? He honestly didn't even register with me when I rewatched ESB recently. So it's safe to say that his popularity baffles me.